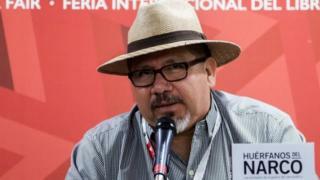 Mexican journalist Javier Valdez, known for his award-winning coverage of the drug trade, has been shot dead. Unidentified attackers opened fire on him on Monday in Culiacan city in the north-western state of Sinaloa, where he lived and worked. Valdez, 50, received the International Press Freedom Award from the Committee to Protect Journalists (CPJ) in 2011 for his work. He is one of several journalists who have been killed in Mexico this year. Valdez was shot dead on the street near the premises of the Mexican news weekly he had founded, Ríodoce. During his career spanning nearly three decades, Valdez wrote extensively on drug-trafficking and organised crime in Mexico, including the powerful Sinaloa drug cartel. The cartel is believed to be responsible for an estimated 25% of all illegal drugs that enter the US via Mexico. Its former head Joaquin "El Chapo" Guzman was recaptured in 2016, following two jail breaks, and was extradited to the US in January. Mexico's President Enrique Peña Nieto condemned the killing, calling it an "outrageous crime", and added that his government remained committed to press freedom. Image caption Mr Nieto said in a tweet that Mr Valdez's killing was an "outrageous crime"
Sinaloa state attorney general Juan Jose Rios said the death was being investigated, and Valdez's family and colleagues would be protected. "Above all else we are interested in Javier's family," he told reporters. The CPJ's Mexico representative, Jan-Albert Hootsen, said Valdez's killing was "an attack on journalism, all journalists throughout Mexico". Mexican news outlets Animal Político and Tercera Vía are going on strike on Wednesday to protest against the murder, and the ongoing risks to reporters. Tercera Vía said on its website [in Spanish]: "The only thing we are going to cover and publish are the activities related to the murder of Javier Valdez." Last week, Mexico appointed a new prosecutor to investigate crimes against freedom of expression - including the killing of journalists. Valdez and his publication had been threatened long before his shooting. He told the freedom of expression organisation Index on Censorship last month that a hand grenade had been thrown into Ríodoce's offices in 2009, "although it only caused material damages". "I've had phone calls telling me to stop investigating certain murders or drug bosses. I've had to suppress important information because they could have my family killed if I mention it. "Sources of mine have been killed or disappeared… The government couldn't care less. They do nothing to protect you. There have been many cases and this keeps happening." Speaking at a launch of his book last year, he said being a journalist "is like being on a blacklist" and that gangs "will decide what day they are going to kill you". In March, after journalist Miroslava Breach was shot dead, Valdez was quoted as saying "No to silence" and "Let them kill us all". Like Valdez, Breach had reported on organised crime, drug-trafficking and corruption. Other Mexican journalists killed this year include freelancers Maximino Rodríguez and Cecilio Pineda Birto, according to the CPJ. The CPJ says at least 40 journalists have been killed in Mexico since 1992.